The Citystay Global Apartment Network (“the Agent”) operates as a part of Citystay Limited which is incorporated and registered in England and Wales, company number 6490880 whose registered office is 4a Beech House, Newmarket Road, Cambridge CB5 8DT. The purpose of The Citystay Global Apartment Network (“The Agent”) is to provide an informed and professional booking service for those individuals and body corporates wishing to book serviced apartment(s) globally outside of Cambridge UK. 3.1 These terms and conditions are for individuals OR organisations who book apartments through The Citystay Global apartment Network either via online reservation contact form, email, and telephone. 3.2 These terms and conditions are only applicable until the Guest receives a confirmation of booking notification from the Agent in accordance with clause 6 below. 3.3 The Citystay Global Apartment Network is solely a booking agent and does not own or operate the serviced apartments advertised on its website outside of Cambridge UK. 4.1 “Guest” means the individual or body corporate that is booking the apartment through the Agent under these terms and conditions. Guest also refers to those individuals who are booking apartment(s) on behalf of somebody else, such as personal assistants and travel managers. 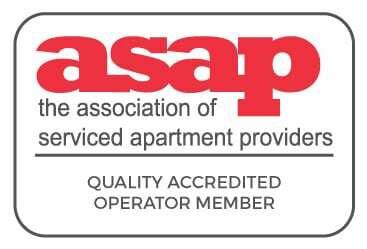 4.2 “Supplier” means the serviced apartment owner and or operator with whom the Guest enters into a binding contract in accordance with clause 4 below. 4.3 “Force Majeure” means any event by reason of any fire, earthquake, flood, epidemic, accident, explosion, casualty, strike, lockout, labour controversy, riot, civil disturbance, act of public enemy, embargo, war, act of God, terrorist act, or any municipal county, state of national ordinance or law, or any executive, administrative or judicial order (which order is not the result of any act or omission which would constitute a default hereunder), or any failure or delay of any transportation, power, or communications system or any other similar cause beyond such party’s control. 4.4 “Personal Information” means information that relates to a living individual who can be identified from that information or from that information together with other information, which is held by or is likely to be held by the Agent. 5.1 The Agent offers a FREE booking service for serviced apartments to the Guest, which means that the Agent does not charge the Guest any fees for booking accommodation. 6.1 The Agent acts as a booking agent for the Supplier. These terms and conditions are only applicable until the Guest receives a confirmation of booking notification from the Agent in accordance with clause 8 below, the Guest must therefore also read the terms and conditions of the Supplier, where the Guest wants to book an apartment. Close attention should be paid by the Guest to the terms and conditions of the Supplier relating to the amendment and cancellation of bookings. 6.2 When requesting a booking via aid of The Citystay Global apartment Network it is deemed that the guest (and all those named in the booking) have accepted, in full, the supplier’s terms and conditions which governs the relationship between the guest and the supplier for the supply of accommodation. 6.3 In the unlikely event that a Guest is dissatisfied with the apartment(s) or Supplier, the Agent will offer assistance to Guests in finding alternative accommodation but cannot accept liability or responsibility for any cause of such dissatisfaction. 7.1 Unless stated otherwise all apartments and services are quoted exclusive of VAT. 7.2 Unless stated otherwise the prices are per apartment per night. 7.3 All prices quoted have been provided to the Agent by the Supplier and all information on the website and prices are subject to change without prior notice. In the unlikely event of a price changing after confirmation of a booking is made the Guest should refer to the Supplier’s terms and conditions. 8.1 The Guest may make a request for accommodation (“Booking Request”) by telephone, e-mail or by using the online booking form on the Agent’s website. 8.2.6 The accommodation that the Guest wishes to book. 8.3 The Agent shall endeavour to acknowledge the booking request within 24 hours of receipt and shall contact the Supplier to ascertain whether the booking request can be satisfied. 8.4.1 Where the requested accommodation is available, make the booking in accordance with the terms of the Booking Request on behalf of the Guest, provided that the Guest has provided credit card details to the Agent. 8.4.2 Where there is no availability, the Agent will contact the Guests as soon as practicable discuss alternatives. 8.4.3 When the Agent confirms to the Guest that the Supplier has agreed to the Booking request (“Confirmation”), the Guest and the Supplier enter into a binding contract subject to the Supplier’s terms and conditions. 8.5 If the Booking Request cannot be satisfied the Agent shall contact the Guest to discuss alternative accommodation options and where the Guest chooses such an alternative, sub-clauses 1-4 of these terms and conditions shall apply as if the Guest had made a Booking Request in relation to that alternative accommodation. 8.6 Any information provided under this Clause 6 is confidential to the Agent but will in some cases need to be passed on to the Supplier to confirm the booking. The Agent confirms that any record it holds of the Guest’s payment details shall be destroyed immediately following Confirmation. Any Personal Information shall be used in accordance with the Agent’s Data Protection Policy as set out in Clause 11. A full copy of the policy is available on request. 8.7 By making a booking through the Agent it is deemed that the Guest acknowledges that they have read, understood and accepted the Agent’s and the Supplier’s terms and conditions. Any breach of the Supplier’s Terms and Conditions by the Guest remains the responsibility of the Guest. 8.8 Any amendments or cancellations between the Guest and the Supplier must be immediately directed to the Agent and shall be dealt with in accordance with clause 8. 8.9 Any quote provided by the Agent will remain valid for a maximum period of 28 days, subject to availability. Should the 28 day period elapse and contact be made, it will be considered a new enquiry. 9.1 The Agent offers the booking service to the Guest as a free service. 9.2 The payment method provided and referred to in the booking request shall be used to pay the Supplier for the price of the accommodation in full upon Confirmation, unless otherwise agreed in writing between the Guest and the Agent. 10.2 For the avoidance of doubt, the Guest acknowledges and accepts that the Agent is not liable for any charges relating to cancellation or amendment. 11.1.3 the Agent accepts no liability for claims losses or expenses suffered by the Guest as a result of acts or omissions of the Supplier. 11.2 The Guest expressly agrees that the use of the website is at the Guest’s sole risk. The website and the content available on it is provided free of charge and on an “as is” and “as available” basis. The Agent expressly disclaims to the fullest extent permitted by law all warranties of any kind, whether express or implied, including, but without limitation, any implied warranties of satisfactory quality, fitness for a particular purpose and non-infringement. The Agent shall not be liable for any loss or damage suffered as the result of the use of the website. 12.1 Any material downloaded or otherwise obtained through the use of the website is done at the User’s own discretion and risk and the User will be solely responsible for any damage to any computer system or loss of data that results from the download of any such material. 12.2 The Agent shall not be liable for any special, indirect or consequential loss or damage including, but not limited to, loss of profit, loss of anticipated profit, loss of business, economic loss, overhead recovery, anticipated savings, loss of data, depletion of goodwill or otherwise or any costs, expenses or other claims for consequential compensation whatsoever (howsoever caused) which arises out of or in connection with the User’s use of the website or any contracts the make with the Supplier or other service providers advertising on the website. 12.3 The Agent is not liable for any misrepresentation, breaches of contract, breaches of statutory duty or negligence of a Supplier. 12.4 The Agent accepts no liability for personal injury, illness or death arising as a result of any act or omission of a Supplier. 12.5 The Agent reserves the right to update any of its terms and conditions or website or any other documents and information at any time. It is the responsibility of users of the website to ensure that they read the terms and conditions. 12.6 The Agent may provide hyperlinks or pointers to other websites maintained by third parties which the Agent thinks may be of interest to visitors of the website. 13.1 Please note that by accessing and using this website you are accepting the practices described. High priority is attributed to your privacy. It follows a data protection policy (available on request) and only that Information which is necessary is collected in order to process a booking. This information is not shared with outside parties except where it is necessary to process a booking. Whereas every effort is made to ensure personal information is accurate and secure no guarantee is offered regarding the accuracy or security of such information over the internet. Your information is used by the Agent to improve its website, customer service and provide statistical data for marketing purposes. Cookies (small files used by websites to identify its users) are used by this website but do not contain personal information. It is possible to disable cookies by altering the settings on your computer. 13.2 It is the policy of the Agent to ensure that all relevant statutory requirements are complied with, including the Data Protection Act 1998 and to monitor the internal procedures of the Agent periodically to ensure compliance. 13.3 Personal Information may be transferred to countries outside the European Economic Area (“EEA”) in order to facilitate the booking of apartments and/or purchase of other services which may not have data protection laws as comprehensive as those that exist in the EEA. In using the website you consent to such a transfer. 13.4 The Agent may disclose Personal Information about site visitors to other organisations that are apartment partners or affiliates or to organisations contracted by the Agent to manage aspects of the website. In particular, the Agent will send Personal Information to the Suppliers and their authorised representatives to enable them to process bookings. 13.4 The website contains links to other internet sites that are not owned by the Agent. The Agent is not responsible for the content of such websites or for the privacy policies of such sites or for Personal Information that such sites may collect or place on the User’s computer. 14.1 In case of a dispute between the Supplier and the Guest, the Agent shall use its reasonable endeavours to provide assistance in resolving the dispute. 14.2 The Agent shall not be deemed in default or held liable for any loss or cancellation suffered as a result of Force Majeure. 14.3 If any provision of these terms and conditions (or part of any provision) is found by any court or other authority of competent jurisdiction to be invalid, illegal or unenforceable, that provision or part-provision shall, to the extent required, be deemed not to form part of these terms and conditions, and the validity and enforceability of the other provisions of these terms and conditions shall not be affected. 14.4 These terms and conditions shall be governed by and construed in accordance in all respects with the laws of England and Wales and in the event of any dispute in relation to these terms and conditions the parties shall submit to the exclusive jurisdiction of the English Courts.